Seismic shocks in racing do not come much bigger than 100-1 winners of the Grand National but 10 years ago Liam Treadwell helped send tremors through the sport when triumphing aboard Mon Mome at those very odds. Treadwell, aged just 23 and on his first ride in the race, steered his supposed no-hoper to a victory that a decade on he remembers fondly for the reaction that was to follow. “It was my first ride in the race and I was delighted to have a ride regardless what chance he had. I can still picture all those faces and the shock. It was a surreal silence from the crowds’ point of view, but I was in dreamland. But it might have been a different story as, just moments after the tapes had been raised, a combination of nerves and a rush of blood to the head almost got the better of Treadwell, pictured. He recalled: “I just wanted to get over the first. If I tipped up at the first, I thought I’d almost let the family and what have you down. As we were going to the first fence I was in a nice position, I saw a stride and Mon Mome put down. I shook my head and said: ‘Sit still and leave it to him’. Treadwell also remembers the moment which enhanced his chances and left the dreams of a colleague in tatters. 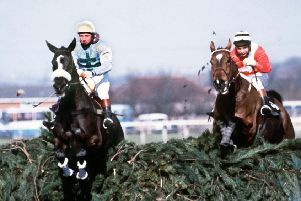 He said: “Second time round at Becher’s there was a bit of a pile up and Black Apalachi tipped up and got rid of Denis O’Regan and the pace seemed to slacken up. I was in the middle to the back of the field and it just meant I could creep closer without having to ask Mon Mome any questions. “Jumping four out was the first time I thought: ‘I’m in a horse race now’. I got caught in a pocket, so I couldn’t go anywhere, which was in my favour and Mon Mome was just filling up so, when the gaps did open, jumping the second-last he came alive underneath me. After the on track celebrations died down, Treadwell experienced just how the race affects so many. He said: “I remember wearing the colours home in the car and we went to a local pub near Venetia’s with all the staff. I was still suffering from the ride earlier where I had to do 10st so I had plenty of water before indulging in other fluids! 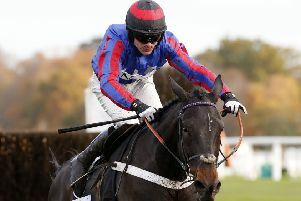 Having announced his retirement in February last year, Treadwell made a low-key return to the saddle at Taunton this month and, although there is no National ride this year, he is just pleased to be back doing the job he loves.